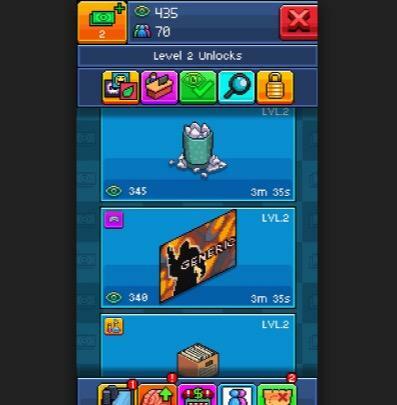 Looking for PewDiePie’s Tuber simulator game tips, tricks, cheats and hacks? Find out how to unlock locked features, visit rooms, get more subscribers and hack your way to YouTube famous status in the new mobile simulator game. 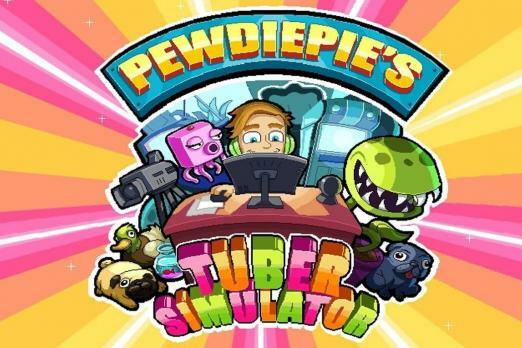 On Thursday, YouTube star streamer PewDiePie teamed up with Outerminds game developers to release a new mobile simulator game called PewDiePie’s Tuber Simulator. The game challenges players to grind their way towards YouTube stardom, one viral video at a time. While the tutorial for the game makes it pretty simple to get yourself up and going, there are a few things that have some folks confused, including how to unlock locked internet features, visit rooms and increase their Tuber star power. Below we’ve put together a guide chock full of tips, tricks, cheats and hacks to help gain YouTube famous status in PewDiePie’s Tuber Simulator. So if you’ve been playing Tuber Simulator any amount of time, then you know the name of the game is making videos that get lots of views so you can gain more subscribers. Gaining subscribers requires getting views. The more views you get the more people will subscribe to your videos. If you just randomly go about making your videos, you’ll get some views but it will be much harder to move your way up to YouTube stardom. If you really want your videos to make an impact, there are some tips and tricks to help with that. So, the first tip to making videos that get more views is to keep track of the trending topics on the “Make a Video” page. Making videos that match one of the trending topics helps increase the number of people who will view the videos and that, in turn, can lead to more subscribers. More views are also useful in purchasing room upgrade items discussed next. 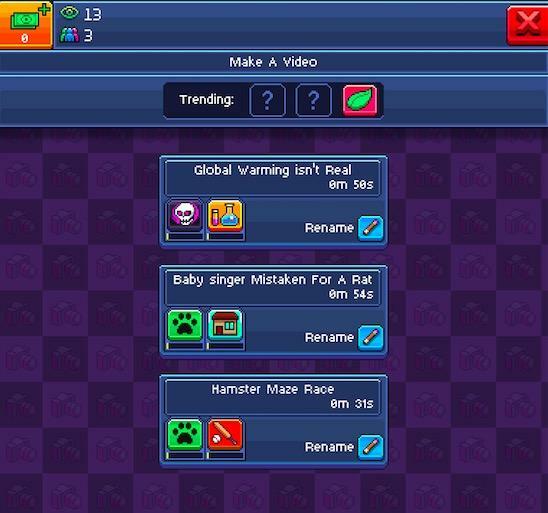 In Tuber Simulator, views work as currency to buy more upgrade items, and those upgrades, when placed in your room, yield more views and/or subscribers. Some of the upgrade items are used to simply increase the number of views per video. Others will increase views and subscribers when a video is on a specific topic. For example, if I purchase a planet poster and put in on my wall, I will not only get 1880 views added to my bank, it will also increase the level of my science skills. Increasing skills will yield more views and subscribers every time you make a video related to that skill. Each day you get four “free” quests and then you can complete three more by paying for them with bucks. You also can watch a video here and there and get quest added. Quests are something you should definitely try to complete. If you do, they will gain you more free views and subscribers. When you upgrade your knowledge tree skills, each upgrade increases the number of views per video that you get, and, by now, we all know how important views are. Upgrading these skills requires one of two things: buying room items related to the skill or purchasing skills on the knowledge tree. 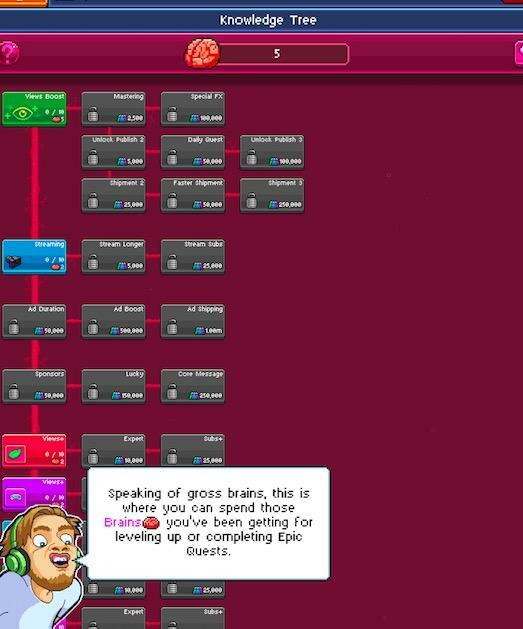 To purchase more skill on the knowledge tree itself, you have to use the “brain” currency. Brain currency is gotten from buying more room upgrades or leveling up. (If you haven’t figured it out yet, everything kind of hinges on everything in this game). So unlocking social features are something that can help you get some good stuff in the game. 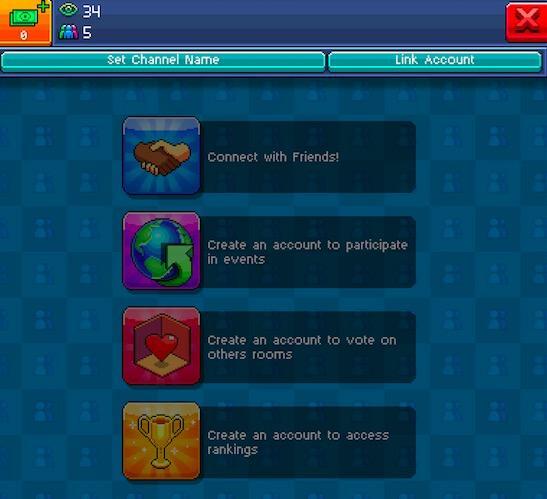 If you go to the Friends icon and create an account (it requires logging in with Game Center and creating a channel name) you will be able to add friends. If you don't have any friends, just type in the name of PewDiePie for starters under the "Connect with Friends" option. You can also type in almost any crazy thing you can think of, and someone has probably made it their username. Friends are good for sending you gifts but you can also visit their rooms to see what they are up to. Visiting rooms will also be required for some quests. To visit a room you simply have to tap on the "Connect with friends" option and tap on the name of a friend in your list. Help! I Can't Visit Rooms Because Features Are Locked! - If you go to the Friends tab and it tells you the features are locked, don’t worry. You probably haven’t done anything wrong. 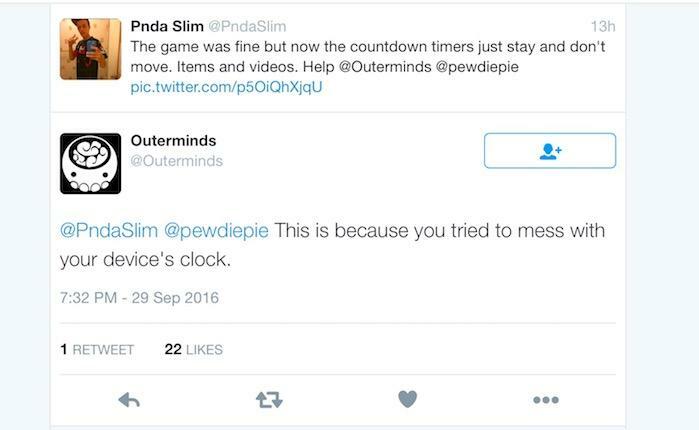 Since the game released, Outerminds has been working hard to fix a number of glitches that have arisen and caused various error 96 and 99 messages. The game saw over a million downloads in the first 24 hours on the app store causing the servers to crash as well. Outerminds have had to temporarily lock the social features like adding friends and visiting rooms a couple of times, so if you can’t seem to use them, it’s probably because the lock hasn’t been lifted yet. 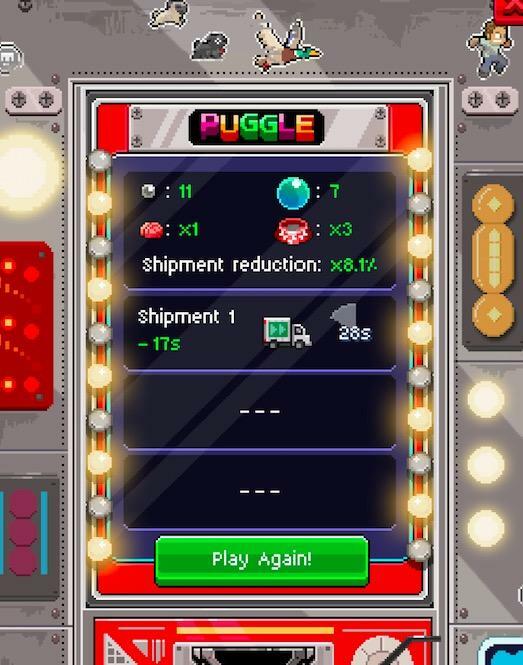 When you purchase an update item and are waiting for it to ship, a new “Puggle” mini-game option appears on the bottom of your room screen. Playing the game can help you reduce the time for shipping the item but you can also when some views and bucks that way too. While playing PewDiePie’s Tuber Simulator, you’ll sometimes hear an eagle screeching. If you go over to your room page, you may see an eagle flying across the screen with a package. Tap on it, and you’ll get a gift. Usually, it includes views or subscribers, but sometimes it’ll have some bucks inside. If you are willing to watch a video, you can triple the amount of the gift. I usually will do this when the gift is sizable. A number of people have tried using various cheats or hacks for PewDiePie Tuber Simulator like the clock-changing hack, but we advise against it. Hacks will cause problems and errors in the game or make it impossible for you to play it online. Have some tips, tricks or strategies that are earning you crazy fame in PewDiePie's Tuber Simulator game? Share them with us in the comments below.